Thomas Jefferson was born on April 13, 1743, to Peter Jefferson and Jane Randolph, and was the third of ten children. Peter Jefferson was a self-taught man but wanted his sons to have a formal education, and enrolled Thomas and his brother, Randolph, in school when Thomas was 5. By 1752, at the age of 9, Jefferson began studying Latin, Greek, and French and read whatever books were in his father's library. In 1757, his father died and his estate was divided between Jefferson and his brother. Thomas inherited approximately 5,000 acres of land, including what would become Monticello. When Jefferson was 16, he entered the College of William and Mary in Williamsburg, Virginia to study mathematics, metaphysics, and philosophy. Jefferson graduated after two years, in 1762, and under Professor George Wythe he obtained his law license, while working as a law clerk in Wythe's office. Jefferson was admitted to the Virginia bar in 1767 and argued a few notable Virginia cases. By 1768, Jefferson began the construction of his famous residence, Monticello, on a hilltop overlooking his 5,000 acre plantation he inherited from his father. He moved into the South Pavilion in 1770. On January 1, 1772, Jefferson married his third cousin Martha Wayles Skelton, and she moved in to the South Pavilion of Monticello with him. They were a happy couple, with Martha frequently playing hostess and managing their large household. They had six children together: Martha, Jane, a son, Mary, Lucy Elizabeth and another Lucy Elizabeth. Only Martha and Mary survived into adulthood. On September 2, 1782, after ten years of marriage, Martha Jefferson died at the age of 33. During this time Jefferson was also involved in politics. Jefferson was the primary author of the Declaration of Independence, written and then ratified on July 4, 1776. This declaration led to the beginning of the America Revolution. Jefferson was inspired by the Enlightenment ideals of sanctity of the individual, as well as the writings of John Locke. The preamble of the Declaration of Independence is regarded as an enduring statement on human rights and contains some of the most well known sentence in the English language. Jefferson also served as a Virginia State legislator and even governor between the years of 1776-1781. When the United States won the American Revolution, the United States formed a Congress of the Confederation and Thomas Jefferson was appointed as a Virginia delegate. Then in 1784, Jefferson was sent by the Congress of the Confederation to join Benjamin Franklin and John Adams in Paris, France as a minister for negotiating Treaties of Amity and Commerce with the other world powers on behalf of the new nation. While in France, Jefferson used his influence to procure trade agreements with France for the United States. Jefferson left Paris for America in September 1789, intending to return soon, however, President George Washington appointed him as the country's first Secretary of State, forcing Jefferson to remain in the United States. While acting as Secretary of State, Jefferson and the other cabinet members faced two major issues. 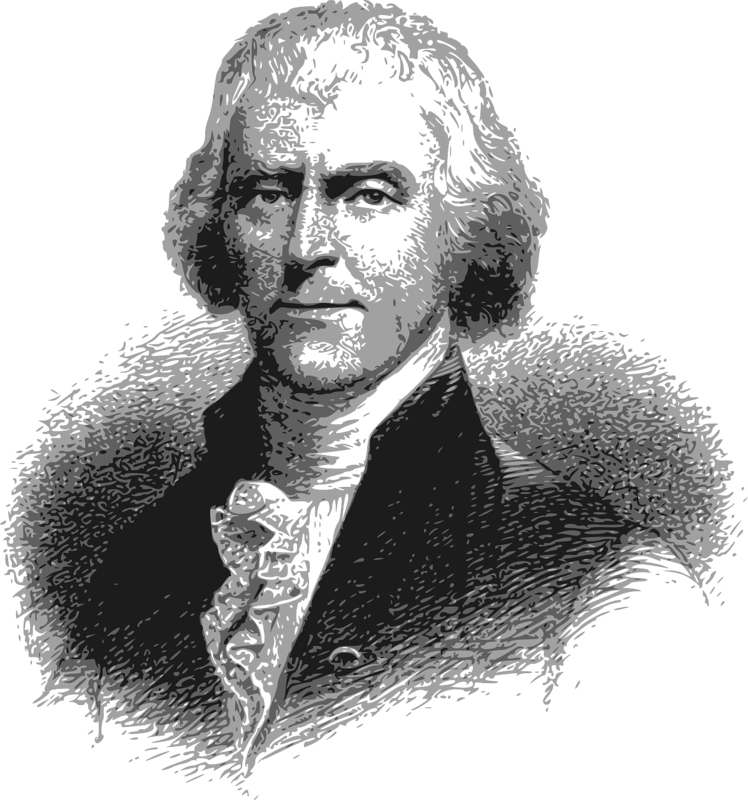 The first major issue was the national debt, which Jefferson opposed, believing each state should deal with its own war debt, instead of consolidating them into a federal debt, proposed by the Secretary of the Treasury, Alexander Hamilton. The second issue was the location of the nation's capital. Many, like Alexander Hamilton, wanted the capital near the major commercial centers of the northeast, while Jefferson, Washington, and other southern farmers wanted the capital in the south. Ultimately, the Compromise of 1790 was reached, placing the nation's capital in the south in Washington, D.C. and the federal government assumed the war debt of all thirteen states, creating a federal line of credit. In December 1793, Jefferson resigned his cabinet position intending to run for president in the 1796 election. In 1796, Jefferson lost the presidential run against John Adams, and was elected as Vice-President. He then ran for president again in the election of 1800 and won. Jefferson was the nation's third president from 1801-1809 and during that time he accomplished many notable things. One of the most notable was that he negotiated the Louisiana Purchase, the acquisition of the Louisiana territory by the United States from France in 1803, which doubled the size of the United States. He then set up the Lewis and Clark expedition for the exploration and mapping of the uncharted territory and set up the United States claim on the territory. Following his retirement from the presidency, Jefferson continued his pursuit of educational interests; he sold his vast collection of books to the Library of Congress, and founded and built the University of Virginia. Jefferson continued to correspond with many of the country's leaders, like James Monroe and John Adams. In 1821, at the age of 77, Jefferson began writing his autobiography, emphasizing the revolutionary era of his life. His health began to deteriorate in July 1825, due to a combination of rheumatism from arm and wrist injuries, as well as intestinal and urinary disorders and, by June 1826, he was confined to bed. On July 3, Jefferson was overcome by fever and declined an invitation to Washington to attend an anniversary celebration of the Declaration of Independence. On July 4 at 12:50 p.m., on the 50th anniversary of the Declaration of Independence, Jefferson died at age 83. A book list celebrating Thomas Jefferson.